Dave Farley’s Weblog | Thoughts on Continuous Delivery and Agile development. I have been talking about Continuous Delivery being, informally, an application of the scientific method to software development for several years now. I have spoken about it, CD, being a candidate for the beginnings of a genuine engineering discipline for software development. My interest in this is related to my interest, as an amateur, in science in general and physics in particular. I am an avid reader of popular science, but I am not very academically qualified in these subjects. Nevertheless I think that there is something important, significant, here. My interests have led me to read more deeply into some of these topics, I am learning more. Two things that have come together recently and made me want to write this piece, which has been brewing in the back of my mind for some time. The first is that I was given a gift, a book that is probably the most mind-expanding book that I have ever read. “The Beginning of Infinity” by David Deutsch is a profoundly deep work on the philosophy of science (and rationality). People are starting to talk of this book, this thinking, as the successor to the work of Karl Popper who’s ideas, in the 1930s, revolutionised the way that science has been viewed and practiced ever since. Popper was the person who described, amongst other things, the importance of being able to falsify theories. The classic example from Popper is – we can never prove that all swans are white, but as soon as we see a single black swan we can disprove, falsify, the white swan assertion. These days a scientific theory is not really valid unless it is capable of being falsified. There are too many ideas in Deutsch’s “The beginning of infinity” for me to summarise them all here, go and read the book – you can thank me for the recommendation later 😉 One of the key points though is that science proceeds by trying to establish what Professor Deutsch calls “Good Explanations”. A “good explanation” is an explanation that is hard to vary without changing its meaning and one that is falsifiable. I think that this philosophy of science stuff has profound impacts on how we should approach software development and even how we view what software development is. The second thing that made start on writing about this, was based on a passing comment that I made on Twitter. I repeated a viewpoint that I have long held that automated testing in software is best thought-of, used, as a falsification mechanism. Amongst several others Bill Caputo replied and included some links to his thoughts on this which very closely aligned with mine and described some of these ideas better than I had. This is very close to the way in which I have started to think about software development in general and more specifically, the more scientifically rational approach to the engineering of software that I try to apply and promote. For me these two ideas collide. David Deutsch’s “Good Explanations” are deeper and more difficult than they sound. In striving for a “Good Explanation” we are required to gather information to allows us to “create knowledge”. I describe software development as an inherently creative process. We don’t often consider it as such and much of software development is, incorrectly, treated as an exercise in production rather than creativity and suffers as a consequence. This misconception has dogged our industry and how we undertake the intensively creative task that is software development. We are trying to create knowledge, in the form of a computer program, that captures our best understanding of the problem that we are trying to address. This is entirely a process of exploration and discovery. The encoding of the knowledge, in the form of something executable, is merely a transcription exercise. So the thinking, the design, the discovery of “good explanations” that fit our understanding is at the heart of all good software development. Of course “merely a transcription exercise” underplays the complexity of that part of the process, but my point is that the technicalities of coding, the languages, the tools, the syntax of the instructions themselves have the same relationship to software development that maths does to physics. These things are tools that allow us to grow and extend our understanding. They are not the thing itself. Maths, and coding, are great fun. I completely understand, and recognise in myself, their appeal, but for me at least, that fun is enormously amplified when I can apply them to something practical. Ideally something that helps me deepen my understanding. Something that helps me to get to “better explanations”. This is kind of obvious if we think in terms of computer science, but kind of missed in much of the discussion and practice that I observe in the software development community. If we think back to our computer science studies we know that we only need a Turing machine, any Turing machine, to solve any classically computable problem. So the choice of tools, language, architecture, design are all only choices. These tools are not unimportant, but neither are they fundamental to solving any given problem. I can write code to solve any computable problem in any language or paradigm. The only difference is how efficient I am in transcripting my ideas. Functional Programming, OO Programming, Ruby on Rails, C++, Java, Assembler can all only render the same ideas. Of course it is a bit more complex than that. Certain programming approaches may help me to think, more easily, of some kinds of solution, others may hinder me. However, I believe that there is something deeper here that matters profoundly to the creation of good software. It is the act of discovery and of learning, understanding the problem in more depth, that characterises our work and is the real value of what we do. I believe that we should optimise our development approach, tools and processes to maximise our ability to foster that learning and process of discovery. We do this by creating a series of better and better explanations of the problem that we are attempting to solve, and the techniques (code) that we are employing to solve it. Our “good explanations” take specific forms. They are the documentation and tests that describe a coherent picture of what our systems should do. They are the code that capture our best current theory of how our code should do the things it should. They are the ideas in our heads, the descriptions and stories that we tell each other, that allow us to understand, diagnose problems, and extend and maintain our systems. These are our good explanations and one of the profound advantages that we have over most disciplines is that we can make many of these “explanations” self-validating for consistency by automating them. I have been a long-term adherent of Test Driven Development (TDD). I don’t take this stuff lightly and over the years of practicing it have refined my take on it. It is an old statement, not original to me, that TDD is not really about testing. I was peripherally involved in the birth of a thing called Behaviour Driven Development (BDD). The idea was to try and re-focus people’s thinking on what is really important in TDD. BDD was born as a means of teaching TDD in a way that led to the higher-value ideas of Behavioural focus and the use of “Executable Specifications” to drive the development of our software. It is a very effective approach and I teach it, and commend it, to the teams and organisations that I work with. I now think that there is something more profound going on here though, and for me David Deutch’s “Good Explanations” hold the key. When we develop some software, any software for any purpose, we are, nearly always, embarking on a process of discovery. We need to discover a lot of stuff. We need to learn more about the problem that our software is intended to address. We need to learn about what works for the consumers of our software, and what doesn’t. We need to discover what designs work well and give us the behaviours that we desire. We need to discover if our solutions are fast-enough, robust-enough, scalable-enough and secure-enough. We start out knowing little about all this, and begin learning from there. At any given moment, in the life of a software system, all of this stuff only adds up to “our best current theory”. We can never be certain of any of it. For the vast majority of human history we were really quite bad at learning. Then a few hundred years ago, we discovered how to do it. We call the trick that we learned then “Science”. Science is humanity’s best, most effective approach to learning – Deutsch would say “gaining new knowledge”. Fundamental to this approach, according to Deutsch, is the formation of these “good explanations” and their defining characteristic that “they are hard to vary” without invalidating them. In trying, at multiple levels, to capture a “good explanation” of what is going on. We are trying to describe the logic and algorithms that capture behaviours that we are interested in. We are trying to describe the data structures of the information that we deal with and process. We are trying, in some manner, to describe the need that our software is intended to address for our users or the market niche that our cool new idea is hoped to exploit. All of these “descriptions” are “explanations” of our understanding. To transform these “explanations” into “good explanations” our “explanations” need to be more rigourous. The need to include everything that we know and, as far as we are able, check that our “explanation” fits all of the facts. A good example of this, taken from Professor Deutsch’s book, is the idea of seasons. Some people believe that winter is caused by the Earth having an elliptical orbit and so being further from the Sun for part of the year. This is a good explanation in that I can’t vary it without changing it significantly. If the idea is correct, changing the explanation to say “The seasons are caused by Earth having a circular orbit” doesn’t work because that completely changes the explanation. So this seems like a reasonable idea, and, even better, it is easily falsifiable. If this were true, if seasons are caused by the distance of the Earth from the Sun, then it should be winter at the same time of the year all over the planet, because the planet is in the same place in its orbit whether I am in London or Sydney. This isn’t the case, so this theory fails. It is a bad explanation because it doesn’t fit ALL of the facts. Let’s try again. Observations show that for any given location on the Earth, the Sun will rise and set at different points on the horizon at different times of the year. Ancients, before global travel, knew this. A good explanation for this is that the axis of the Earth’s rotation is tilted with respect to its orbit around the Sun. The axis is tilted and precesses as the Earth orbits the Sun. That means that when our part of the planet is tilted toward the Sun we get more energy from the Sun because it is more directly overhead (we call this Summer) and when tilted away we get less energy (we call this Winter). So if I was an ancient Greek, and knew about axial tilt as an explanation of seasons I could make a prediction. When it is Summer here, it will be Winter on the opposite side of the planet. This explanatory power is profound. It allows ancient Greeks to predict the seasons in a place that their descendants wouldn’t get to travel to for thousands of years! So what has all this philosophy of science stuff got to do with software? Well this science stuff is humanity’s best problem solving technique. It is the difference between essentially static, agrarian civilisations that lasted for tens of thousands of years with virtually no change and our modern, high-tech civilisation that doubles its knowledge every 13 months. The application of science to solving practical problems is how we solve the most difficult problems in the world. It is also what we call “Engineering”. I believe that we should apply this kind of thinking, engineering thinking, to software development. What that takes is a significantly more disciplined approach to software development. The rewards though are significant. It means that we can create high-quality software, more efficiently, more quickly than we have before. It means that our software will better meet the needs of our users and it means that the organisations in which we work can be more successful, while we are less stressed by trying to solve insoluble problems like “when will I be ready to release the new feature and get the product owner off my back?”. So, step 1 is to approach software development as an exercise in learning, of discovery. If our best way to learn is Science, and software development is all about learning, then we should apply the lessons of Science to our approach to software development. Following Deutsch’s model we should be trying to create “good explanations” that are “hard to vary” and then we should evaluate our explanations with each other, and with reality to confirm that they are consistent. What does this mean in practice? We could try to write down some explanations of what we would like our software to achieve. We are not going to understand the totality of what we want our software to achieve at the outset, that is something that we will learn as we progress and understand the problem, and hopefully the demand, in more depth. So we are looking for a way in which we can capture our current intent and expectations in a form that we can later extend. How wonderful would it be if we could somehow capture these explantations of our current understanding in a form that would allow us to confirm that they are consistent with one another and met as we proceed to elaborate and extend our theories. To me this is pretty much the definition of TDD. It allows us to record an incrementally evolving collection of, hard to vary, explanations that capture our current understanding. If we are smart, we capture them in a way that allows us, with the help of Continuous Integration, to immediately see if our theories, our “good explanations”, in the form of our code meet our expectations – do the tests pass? This approach allows us to construct and re-use an automated system of checking that our “good explanations” are consistent with one another, that the body of our knowledge (of the system) as a whole is self-consistent. This, in turn, means that, as our understanding deepens, we can make small changes to our ideas and quickly and efficiently confirm that everything still makes sense. This approach allows us to stay informed about the state of our system-wide understanding, even as the scope of our system extends beyond our ability to intuitively understand it in its entirety. It means that we can extend and deepen our knowledge in a particular focused area (a new feature of the system). I believe that the TDD approach, refined and elaborated upon by Continuous Delivery, represents a genuine “Engineering Discipline” for software development. I don’t mean this in a loose sense. I don’t mean that this is “analogous to Engineering”. I mean that it allows us to use a more scientifically rational approach to validating our ideas, measuring their effect and maintaining an ever increasing, consistent, collection of “good explanations” of our system and its behaviour. I got into a small debate about software development with someone recently via the comments section to a previous blog-post. During the course of the debate I thought of an analogy to make part of my argument, but I think that it has broader applicability, which triggered this post. I have been talking to a lot of people lately about “Software Engineering” and debating with people that I know, and some that I don’t, about what it takes to establish a profession, and an engineering discipline. I perceive a reasonably broad consensus, amongst people that we may consider thought-leaders in our industry, some of whom I am happy to call friends, about what “good” software development looks like. I also perceive a level of dismay in that group about much common practice. So what are these disciplines and where is the consensus? I perceive a broad agreement that waterfall style thinking, although still very common in practice, is a busted idea. The data is in, it just doesn’t produce great software! Software development is a learning process, from beginning to end. So we must work to establish effective, high-quality, fast feedback loops in order to maximise our opportunities to learn. That means working iteratively, as well as lots of other things. We are not good at predicting the future and so we must be experimental, we must be sceptical of our ideas and find ways to evaluate them quickly and effectively. We need to be more data-driven, measuring rather than guessing. Automated testing provides a substrate that helps us to achieve many of these goals. Taking a test-driven approach to development enhances the degree to which we can carry out these fast, cheap experiments in the design, and implementation, of our code. If I am to be intellectually honest in my convictions, then all that I have just said about the development of code is also true about the creation and evolution of our approach to development. We should be data-driven, empirical, experimental in our approach to improving development process. On the “data-driven” front we are making some progress. The excellent work done by my friends at DORA has raised the bar on measurement of process and practice in our industry. Their new book Accelerate explains the science behind their measurements. The results of these measurements are that, for the first time, we have data that says things like “Your company makes more money if you do x”, where ‘x’ is doing some of the things above. The DORA folk have a model that predicts success (or failure) of your development approach. All of this is based on a peer-reviewed approach to data collection and analysis. We can interpret these perceptions in several ways. Perhaps I am wrong and merely echoing the contents of my own filter-bubble (probably to some extent!). Most of the “thought leaders” that I am thinking of are old-hands, a polite euphemism meaning that my social group is getting-on a bit. Maybe these are the rants of old men and women (though most are men, which is another problem for our industry sadly). A more positive interpretation, and one that I am going to assume for the rest of this post, is that this represents something more. Perhaps we are beginning to perceive the need to grow-up, a little, as an industry? My own, primary, interest in this is around the engineering disciplines that I think that we should try to establish as a norm for software developers who consider themselves professionals. I would like us to have a more precise definition of what “Software Engineering” means. It would need to rule some things out, as well as define some things that we should always do. Others are interested more in the “Profession” side of things. I have recently seen a rise in people discussing ideas like “ethics” in software development. Bob Martin has a couple of interesting talks on this, and closely related, topics. He makes good points about the explosive growth of our industry and the consequent dilution of expertise. He estimates that the average level of experience, amongst software developers, is just 5 years. As a result we, as an industry, are very bad at learning from the mistakes of the past. I have been careful in my choice of words here. Currently we are not a “Profession” we are a “Trade”. The difference between these two is that a “profession” demands qualifications as a barrier to entry, and has rules to reject people that don’t conform to its agreed, established norms. By these defining characteristics we don’t qualify as a profession. You can’t practice law or medicine without the appropriate qualifications. In our industry, if you can pass the interview, you can take part. If I can convince an interviewer that I am competent, over a small number of hours during the course of an interview, I could go and write software that controls an aeroplane, a medical scanner or a nuclear power plant. An individual company may have rules that demand a specific degree, or other qualification, but our “trade” does not. If you are a surgeon and you decide that washing your hands between operations is a waste of your valuable time, once people notice of the increased death-rate at your hands, you will be “struck-off” and not allowed to practice surgery ever again, anywhere. There can be no profession without professional discipline. This resonates with me. I advocate for some specific practices around software development. These practices work together, in sometimes subtle ways. I believe that the combination of these practices provide a framework, a structure, a disciplined approach to software development that has the hallmarks of a genuine “engineering discipline”. I believe that, like “washing your hands” as a surgeon, some of these disciplines are so important that they should become norms for our industry. I don’t doubt that you can write software without fast feedback, without automated tests, without an experimental approach, without collaborative teams and with big-up-front designs and with a 12 month plan. A positive outcome, though, is much less certain. Just because some surgeons had patients that survived, despite their lack of hygiene, doesn’t mean that hygiene isn’t a better approach. These days, nobody can consider themselves a surgeon if they ignore the disciplines of their profession. I believe that one day, one way or another, we will, of necessity, adopt a similar approach. If we are to establish ourselves as a profession, rather than as a trade, we will need to do something like this. Software is important in the world. It is the revolutionary force behind our civilisation at the moment. I foresee three futures for our industry. 2. We start trying to define what it means to be a “Software Professional” in the true sense of the words. Something bad happens, but the regulators work with us to beef-up our profession, because they can see that we have been trying to apply some “duty of care”. 3. The AI Singularity happens and our Silicon overlords take the task of writing software out of our hands. Scenarios 1 and 2 are both problematic. I fear that we will continue with 1. The short-term economic imperative will continue to drive us, for a while, until the population at large realise just how important software has become. At which point there will be repercussions as they react to the lack of a sufficient duty-of-care in many instances. The VW emissions scandal is an early warning of this kind of societal reaction, I think. Scenario 2 is problematic for different reasons. I think that it is the more sensible strategy, but it demands that we change our industry and allow it to progress from trade to profession. Daunting! At which point, if we succeeded, I would be expelled for not having any relevant qualifications. This is a big challenge, and not just for me personally ;-). Our industry is still growing explosively, educational establishments are not really delivering people with the skills ready to be “professional” in the sense that I mean. Many universities (maybe even most) still teach waterfall development practices for goodness sake! My own experience of hiring and training young people into our industry suggests that there is relatively little advantage in hiring Computer Science graduates over most other graduates. We pretty much had to start from scratch with their brain-washing, errrr “on-the-job training”, in both cases. It is easy, even common, to graduate from a CS course and not be able to program, let alone program well. Physics, and other hard-science, graduates have a better understanding of experimental discipline and scientific rigour. The main problem with physicists (and most CS graduates) is getting them to realise that “yes, programming is actually quite difficult to do well” and the techniques that work for a few lines of private code don’t scale well. There is still much debate to be had. Despite the fairly broad consensus that I perceive on what it means to apply “engineering thinking” in software, I still regularly get people arguing against the practices that I recommend. If I am honest, most of these arguments are ones that I have heard many times. Often these arguments are based on dogma rather than measurement or evidence. If we are to be more scientific, apply more engineering discipline to our work, we cannot base our decisions on merely anecdote. That is not how science and engineering work! I am not arrogant enough to assume that I have all of the answers. However, I confess that I am hubristic enough to believe that the people expressing “ridicule and opposition” on the basis of dogma or only anecdote don’t have a strong case. Mentally I dismiss those arguments as being analogous to the surgeons who don’t “wash their hands”. If you want to change my mind, change it with data, change it with evidence. In both cases, existing practitioners, who don’t “wash their hands”, claim that this is unnecessary and a waste of time. I think that the data, and, I hope one day, history, is on my side. My preference is to strongly encourage teams to adopt the norm that most work will be done working in pairs, but not to make it a rule. I think it right to leave room for people to decide for themselves when it doesn’t make sense. However, you are right, ALL of the data that I have seen from studies of pair programming say that it produces higher-quality output, and so in the long run, is significantly more efficient in delivering new code. More than that, I know of no better way to encourage collaboration, learning and continual improvement in a team than pair programming. So it is strongly in a team’s interest to adopt and encourage pair programming as the norm. It is not good enough to reject it because some people don’t like it. That would be like mountain rescue teams rejecting the use of ropes because it is annoying to carry them up the hill. Some things have value even if they take some work. For me, this means that it is worth some effort, maybe even significant effort, for a team to adopt, learn and make pair programming a fundamental part of their development culture. My experience has been that most people, before they have experienced it, are nervous of pairing. In part I think that this is a cultural thing, we “program” people to imagine software development as a lonely introspective act. I don’t think that good software development is really like that. It is, at its heart, a process of learning. We learn best when we can try-out new ideas and quickly discard the bad ones. One way to test ideas is to bounce them off another person. So pair programming provides us with a mechanism to quickly and cheaply exercise ideas and weed out some of the bad ones. There are also some individuals who will always find pair programming stressful. If I am honest, I believe that these individuals have a more limited value to the team. They may have value, but that value can’t be as much as someone of similar skill who learns faster and teaches more. Introverted people are more sensitive to stimulation than others, and so need more quiet time to reduce the cognitive clutter. I am one of these people. I need, periodically, to be on my own to organise my thoughts. This doesn’t mean that people like this can’t take part in pair programming, it does mean that you have to give them some space, some of the time. So, my idea of “optimal” is to do most, nearly all, development work in pairs but allow humans to be human. If someone needs time to form their thoughts, or learn some tricky concept alone, or just needs some quiet time to recharge for a bit, give them that time. There is another important aspect to this. There is some skill to pair programming. It takes time to learn some of the social aspects. For example, one very common behaviour that I see, in newbies, is for my pair, when I am typing, telling me letter-by-letter when I make a typo or what the instruction is. They are trying to be helpful, but they are not. Watch your own typing for a bit. If you are anything like me, then your typing will progress forwards and backwards as you make little mistakes and then correct them all of the time. When this happens you know, as you type, that you made a mistake. Most errors you correct immediately. Someone telling you at this point, actually slows you down. It interrupts the flow of your thinking – and it is irritating. So when you are pairing, and you are not typing, give people a chance to spot, and correct, their own mistakes. Only mention a typo when the typist has moved on and clearly missed it. Only mention the correct use of a language construct or api call if the typist is clearly stuck. Otherwise KEEP QUIET! The classic description of the roles in pair programming are “Driver” (the person who is typing) and “Navigator” (the person who is not). This is a bit crude, but close. If you aren’t typing your focus should be on the direction of the design rather than the typing. The other important aspect of pair programming as a learning activity is to regularly rotate the pairs. Change pairs often, don’t allow pairs to become stale. My preference is to change pairs every day. This sounds extreme to some people. It means that nearly everyone works on nearly everything that the team produces over the period of a week or two. It means that you get to see different people’s styles of working (and pairing) and learn from them. It means that you get to work with the person on the team that you find trickiest to pair with and with the person that you enjoy working with the most, on a regular basis. Pairing means that you are working in very close proximity to other people. Think of your pair as a team, you have shared goals and will succeed, or fail, together. Be considerate, be collaborative, be kind! If you get this kind of stuff right, then the barriers to pair programming begin to reduce. Even the introverts on your team will not only take part, but will benefit from it. Pair programming takes time to adjust to. This is not something that you can try for a day or two. It takes a while for a team to get really good at it, so allow yourselves the time, don’t give up too soon. I have blogged about TDD before. I think that it is one of the most important tools in improving the design of our software, as well as increasing the quality of the systems that we create. TDD provides valuable, fine-grained feedback as we evolve the solutions to the problems that our code is meant to address. I sometimes teach people how to practice TDD more effectively, and one of the things that I notice is that one subtlety that people often miss is the difference in focus for each of the TDD steps. True TDD is very simple, it is “RED, GREEN, REFACTOR“. We write a test, run it and see it fail (RED). We write the minimum code to make it pass, run it and see it pass (GREEN). We refactor the code, and the test, to make them as clean, expressive, elegant and simple as we can imagine (REFACTOR). We should be wholly focussed on expressing the behavioural need that we would like our code to address. At this point we should be concentrating only on the public interface to our code. That is what we are designing at this point, nothing else. If you are thinking about how you will implement this method or class, you are thinking of the wrong things. Instead, think only about how to write a nice clear test that captures just what you would like your code to do. This is a great opportunity to design the public interface to your code. By focusing on making the test simple to write, it means that if ideas are easy to express in our test, they will also be easy to express when someone, even you in future, uses your code. What you are really doing, at the point when you strive for a simple, clear test, is designing a clean, simple to use, easy to understand API. Treat this as a distinct, separate step from designing the internal workings of the code. Concentrate only on describing the desired behaviour in the test as clearly as you can. Experienced TDD practitioners, like me, will tell you to do the simplest thing that makes the test pass. Even if that simple thing is trivial, or even naive. The reason that we advise this is because your code is currently broken, the test is failing. You are at an unstable point in the development. If you start to try and do more complex things at this point, like make your design elegant or performant or more general, you can easily get lost and get stuck in a broken state for a while. If the “simplest thing” is to return a hard-coded value, hard-code it! This does a couple of things. It forces you to work in tiny steps, a good thing, and it also prompts you to write more tests that allow you to expand the logic of your code, another good thing. Your tests should grow to form a “behavioural specification” for your code. Adopting the discipline of only writing production code when you have a failing test helps you to better elaborate and evolve that specification. Don’t worry, we won’t forget to tidy-up the dumb, overly simplistic things that we do at this point. Over-complicating the solution is one of the commonest mistakes that I see TDD beginners make. They try to capture too much in one step. They prefer to have fewer more complex tests than many, small, simple tests that prod and probe at the behaviour of their system. The small steps, in thinking and in code, help a lot. Don’t be afraid of many small simple tests. Always refactor on a passing build. Wait until you are in the “GREEN” state before you begin. This keeps you honest and stops you wandering off into the weeds and getting lost! Make small simple steps and then re-run the tests to confirm that everything still works. Refactoring is not just an afterthought, it is not just about aligning the indents and optimising the imports. This is an opportunity to think a bit more strategically about your design. It is important that we treat it as a separate step. I often see things that I want to change either when writing a test (RED) or when writing code to make the test pass (GREEN). On my good days, I remember that this is not the time. I make a note and come back to it once the test is passing. On my bad days I often end up making mistakes, trying to do things in steps that are too big an complicated, rather than small and simple, and so I end up having to revert or at least think a lot harder than I need. If you use a distributed VCS like GIT, I recommend that after each refactoring step, after you have checked that the tests all pass, commit the change. The code is working, and the committed version gives you a chance to step-back to a stable state if you wander-off into more complex changes by mistake. In general, I tend to commit locally after each individual refactoring step, and push to origin/master after finishing refactoring, but before moving-on to the next test. Another beginner mistake that I frequently observe is to skip the refactor step all together. This is a big mistake! The refactor step is the time to think a little bit more strategically. Pause and think about the direction in which your code is evolving, try and shape the code to match this direction. Look for the cues that tell you that your code is doing too much or is too tightly-coupled to surrounding code. One of my driving principles in design is “separation of concerns” if your code is doing “something AND something else” it is wrong. If your code is doing a business level calculation and is responsible for storing the results – wrong! These are separate and distinct concerns. Tease out new classes, new abstractions that allow you to deal with concerns independently. This naturally leads you down the path towards more modular, more compose-able designs. Use the refactoring step to look for the little cues in your code that indicates these problems. If the set-up of your tests is too complex, your code probably has poor separation of concerns and may be too tightly-coupled to other things. If you need to include too many other classes to test your code, perhaps your code is not very cohesive. Practice a pause for refactoring every single time you have a passing test. Always look and reflect “could I do this better?” even if sometimes the answer is “no it is fine”. The three phases of TDD are distinct and your mental focus should also be distinct to maximise the benefit of each phase. I gave a presentation on my recommended approach to Acceptance Testing today, here at GOTO Copenhagen. Question: How do we obtain repeatable tests in cases when we can’t avoid that each test action updates the system state? How do we cope with non-repeatable tests? Answer: I have yet to find a case where the “Functional Isolation” techniques that I described don’t suffice. Use the existing structures in the system to isolate test cases from one another. Question: Great talk! How to you suggest to keep (concurrent) test cased isolated if faking the system time? Answer: Thanks 😉 This is one of those cases where using one deployed version of the system doesn’t work. In the case of “Time-Travel” tests, then each test does need its own version of the System under test. So for each time travel test you have to incur the cost of deploying and starting the system – these tests aren’t cheap! Answer: I think that the tech is relatively simple, the hard parts are changing the way that people think about tests and testing. Which parts of this are *most* difficult depends on the team. Some teams find it very hard to move responsibility for the tests to developers. Others find it difficult to translate, often over-complex, too-large, requirements into sensible user-stories that make it easy to map from story to executable specification. Question: If you use such effort on building a nice DSL for the tests… Why doesn’t the actual system not just have such a nice API? Answer: Good question, I think that good design pays, wherever you apply it. But however good your API design, I advise that you keep a layer of “insulation” between your test cases and the API. 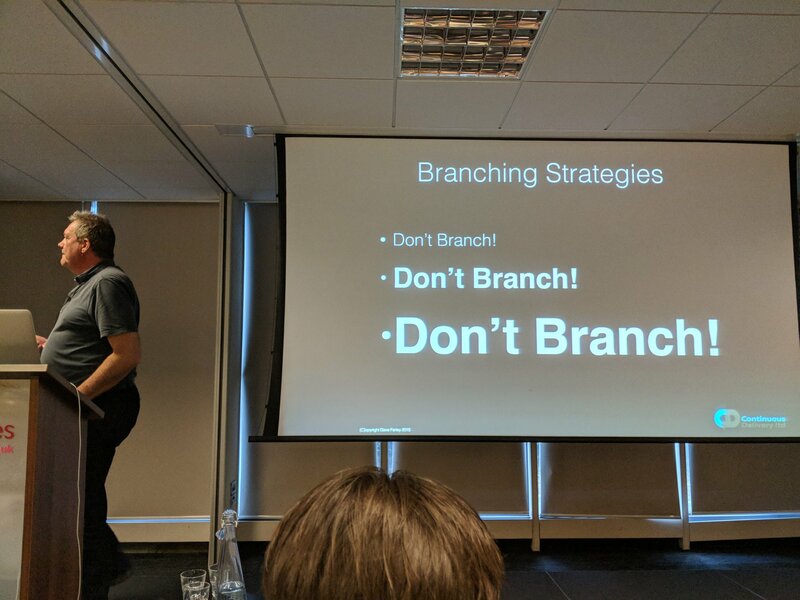 If your API is a wonderful exercise in clarity and brevity, the map to domain language will be simple, but you still need a separate place to allow you to manage changes. Executable Specifications/Acceptance Tests are a special case. When writing them you will be expressing ideas at a different level of abstraction to what is needed through a programatic interface. So you want enough “wiggle-room” to allow you to cope with those variances. Question: If I am a developer of System B, which is downstream from System A, I should write tests for the output of System A, to check if it still respects the interface. But, how do I know what are the inputs to the System A to make it output what I am expecting in my test? Question: Test infrastructure is also code, how do you test the test infrastructure itself? Question: Loosing the “checks and balances” aspect does not seam like a good idea. If it’s the developer owning the acceptance tests, won’t he just test what he thinks is valid? Answer: I am afraid that I don’t buy the “Checks and balances” argument. IMO automated testing is less about testing and much more importantly about development process and quality in design. Automated testing makes me design and architect systems in a way that leads to better systems. It encourages modularity, separation of concerns and many other good properties this is true of both TDD and Acceptance Testing (ATTD). 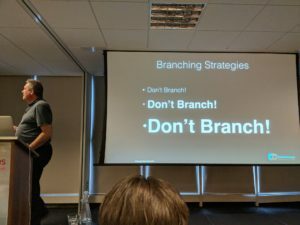 I think that professional testers add to the quality of testing, but they do this by educating development teams to do better, and by exploratory testing – not through taking ownership of Quality/Testing. Demming said “You can’t inspect quality in to a product”. Quality is designed in, testing is most important to the degree that it informs design decisions, and so it needs to be up-front and intimately involved in the development process. Question: Assuming that its cost intensive, How much acceptance testing is enough? Answer: You do spend a lot of time, and money on infrastructure, to adopt my recommended approach to testing. However, ALL of the data from the industry says that it pays for itself. This is a way of going faster with higher quality. If it wasn’t, I wouldn’t recommend it! What happens is that you trade-off the effort of building and maintaining automated tests against the effort of fixing bugs from production. Organisations that practice Continuous Delivery normal report at least an order of magnitude reduction in bugs in production. Imagine what you could do if you had 1 in 10 of the bugs that you currently have. Imagine if your team could spend 44% more time on new work? Thanks to everyone for all the questions, enjoy the rest of the conference! Ever had that sickening feeling that you have lost some important data? I have been travelling a lot lately and arrived home to find that my personal blog site, this site, was down. I host this site via a hosting service, running WordPress, as well as a few other things. This site started out as a personal thing, and I didn’t expect many readers. Turns out that I have more readers than I expected – Thank you! As I started digging into what was wrong, I got that sickening feeling! The DB on my host that contained the content of my blog site had vanished completely. I spent a few days trying to find what had happened and find the data for the posts, all to no avail. So, after some code-archeology, I have managed to patch something together from the most recent backup, a shamefully old one, and the manual copies of my posts. As a result I have certainly broken links to some of my more recent posts – very sorry. I have also probably spammed anyone with an RSS feed for my site – very sorry again! I am sorry for any inconvenience that I have caused, hopefully normal service will now be resumed.